HOME » Case » How to choose the electric hoist? How to choose the electric hoist? Lifting height: electric hoist as a lifting tool, there will have strict requirements to lifting height. So when choose and buy the hoist, first according to the height of workshop to choose the height of lifting heavy objects. Conventional hoisting height 6, 9, 12, 18, 24, 30 m, special occasions, you can according to user requirements for non-standard design. 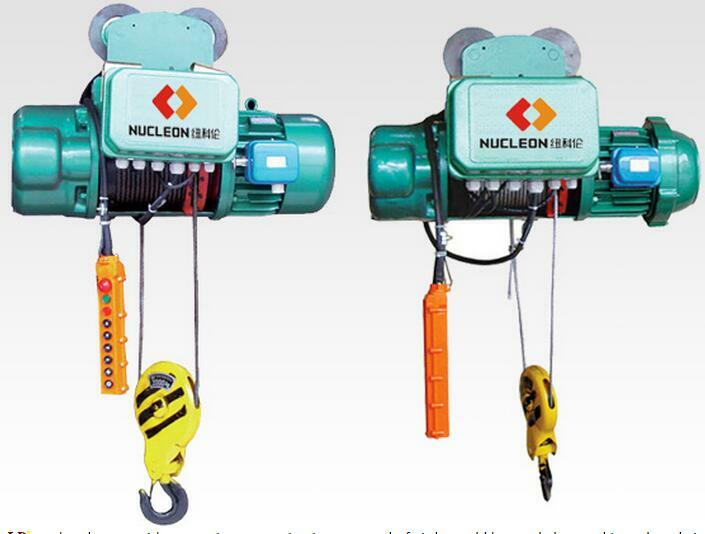 Speed: general electric hoist lifting speed can be divided into single speed (8 mmin) and double speed (80.8 mmin) two kinds. In general, no special requirements of the situation often choose single speed electric hoist (CD1 type), If you need to pinpoint the conditions required in the process of lifting the case, Easy to use double speed electric hoist (i.e., MD1 type), In general, the lifting speed decides the efficiency of your work, The high speed electric hoist, more can improve your efficiency. Motor power: different electric hoist used in motor also not necessarily exactly the same, Also 10 t electric hoist motor can also be 13 KW or is 7.5 KW, customers can choose according to their different needs. Voltage: electric hoist use in all walks of life, so the electric hoist adopts voltage is not the same, There are 380 v industrial electricity 220 v domestic load, There is even a 440 v, 60 hz, 380 v, 60 hz and a series of non-standard power supply. Installation method: electric hoist can be divided into electric car type (that is, the electric hoist can be about lifting heavy objects can move up and down) and stationary (lifting heavy objects up and down only), Fixed and can be divided into fixed (A1) and fixed (A2), the user can choose according to actual situation for installation of electric hoist. I iron floor to electric hoist hook center distance, Electric hoist the choose and buy should pay attention to hook the spacing between the up and down, Because in certain plant will have specific request for the electric hoist hook spacing, if you have strict requirements on hook spacing, low building height electric hoist can meet your requirements.